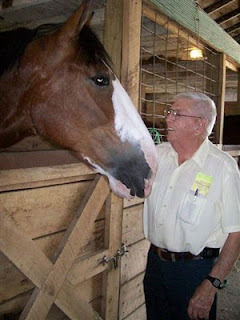 A beautiful Percheron draft horse at Lake County (Ohio) Fair 2010 wishes his human counterpart a happy 76th birthday. Obviously, the equine version is younger than the human. And while the Percheron is still working, the human has retired. But they have things in common: a history of work. NOTE FROM R.A.T. (Rose About Town). I have just met the Percheron. But within a few weeks, I will have been hitched to the man for 50 years. We've been a good team.